Kevin: For the last five years in Sleep and Dreams we've developed a really rewarding education partnership with Menlo-Atherton High School, which is just a few short miles from our campus at Stanford. 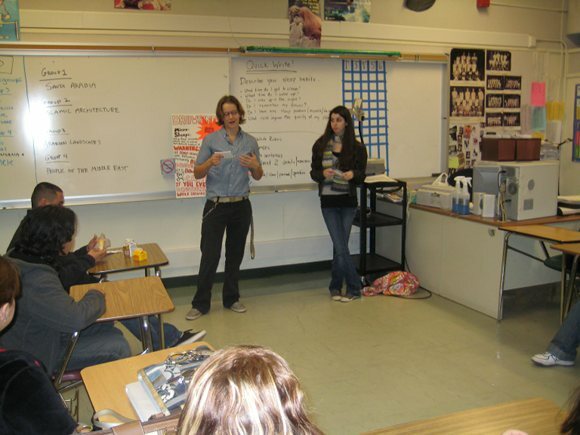 Stanford students Laura Bomes and Barbara Barnes getting ready for their sleep presentation to students at Menlo-Atherton High School in 2010. Each year several dozen Stanford students from Sleep and Dreams prepare a presentation on the essential aspects of the sleep knowledge they are learning in class to share with the freshmen high school students at M-A. 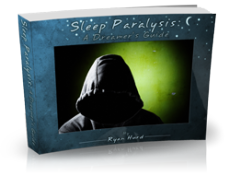 They present this information with the help of several dozen juniors from M-A--known as Sleep Ambassadors--who take part in a bit of training that includes a visit to the Sleep and Dreams class earlier in the year. Thinking back to when I was in high school a few years ago and the consistently mounting sleep deprivation that came along with it--as well as the lack of any formal scientific class discussion about it--it's clear to see how valuable an education on sleep is at this stage of life. This page is dedicated to sharing the success of the M-A/Stanford education partnership, and providing information about it to those who'd like to learn more. I'll now turn it over to Maggie Betsock, the current director of the M-A Teen Sleep Program, to tell you more about it. Menlo-Atherton High School's Teen Sleep Program was launched in the fall of 2006. 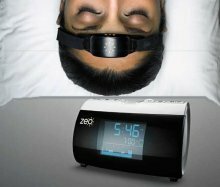 In 2008, the program received an honorable mention from the National Sleep Foundation's Healthy Sleep Community Awards for its "comprehensive, student-focused sleep education campaign." In 2009, the program was awarded the prestigious Golden Bell award by the California School Boards Association. Six presentations for parents and faculty by world renown sleep experts Mark R. Rosekind, Ph.D. and William C. Dement, M.D., Ph.D. In addition, a proposal was made to the SUHSD to implement a later start time. This resulted in a board decision to create a district-wide policy that all four high schools in the district start school no earlier than 8:30 a.m. This policy was instituted at Menlo-Atherton High School in August 2010 with a school start time, for the large majority of students, of 8:45 a.m. The Menlo-Atherton High School Sleep Program will create and support a dynamic and enduring sleep education program that will strengthen the health, performance and resilience of M-A students and benefit faculty and families in our community. This section describes the annual program developed for the sleep education of the Menlo-Atherton freshmen. (The education of parents, faculty and community has been handled through a variety of events and publications.) The program would not be possible in its current form with the considerable support of Dr. William Dement at Stanford University. 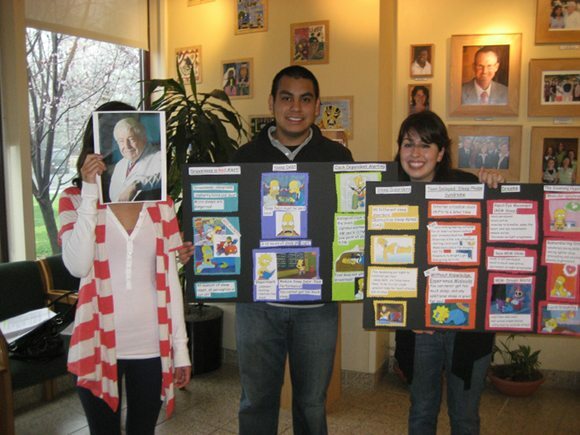 Maritza Urquiza & Jeffrey Garcia show off their Simpsons-themed presentation during the 2010 program. To build student interest and responsiveness to the information presented, a key component to the student program is the use of upper-level high school and college students as presenters. In 50-minute sessions, and teamed with students from Dr. Dement's "Sleep and Dreams" class, "Sleep Ambassadors" from among M-A's junior class science students co-present information on sleep, particularly teen-related issues, to the freshmen class. Another key element is the focus on small class sizes for these presentations. Presentations are done during freshmen World Studies periods to allow a low ratio of students to presenters--approximately ten to one (30 students with 2-3 presenters). A consistent training program for the M-A Sleep Ambassadors has been used. The ambassadors receive training via written material, a field trip to the Stanford Sleep Clinic and to a session of the "Sleep and Dreams" class. They further meet with Stanford Teaching Assistants to review the presentation (which is pre-prepared). The ambassadors actually present only a small portion of the overall presentation but it is the section devoted to teen sleep issues. These juniors are typically short on time and the effort has been made to minimize the amount of non-essential time needed to work on the project. Further, the ambassadors serve a valuable service as campus hosts to the Stanford students. The juniors who participate receive a Letter of Commendation from the principal. Stanford students Laura and Barbara presenting to a class of M-A freshmen. The use of Stanford students has been essential. With the cooperation of Dr. Dement, the Stanford students from his class receive grade credit for their participation in this outreach program. These students must give practice presentations to the TAs and are evaluated using a grading rubric developed for both the presentation and presentation materials. This ensures a high level of performance and has consistently been accompanied by a high level of enthusiasm by the students. Follow-up surveys among the freshmen have shown significant increases in knowledge about sleep issues and awareness of their own need for more sleep. You can learn more about both teen sleep issues and the Menlo-Atherton High School program at their website: m-ateensleep.seq.org. That site will also give you more links to sleep issues. A Faculty Advisory Committee (L. Otsuka, S. Priest, L. Ryne) has also been formed to provide you with more information. If you are interested in implementing a similar program at your local high school and/or would like to get in touch with Maggie, feel free to do so by submitting the form below, which goes straight to her.